As the world continues to reel from the vicious terrorist attack that left 12 dead at the French satirical magazine Charlie Hebdo, for some in the West the inevitable finger pointing and blame game has already begun. In one corner, right-wing blowhards attempt to smear the entire Muslim faith of over 1 billion people with the heinous acts of two fanatics. While in another corner, politically-correct ninnies minimize the horrible killing of these writers and cartoonists by referencing the paper’s history of “xenophobia, racism, sexism, and homophobia” and claiming the publication somehow “provoked” the violence from Islamic extremists. Both of these reactions are an affront to civil society. We cannot blame the whole of the followers of Islam for the actions of a group of marginalized individuals. Painting with this broad-brush point of view is a major contributor to the ease with which an entire society can label Muslims as “the other”. It’s this mentality that helps support military imperialism and the wholesale torture and killing of people in far off countries. The second mind-set, one that would explain away the barbaric nature of these killings by limiting freedom of speech, takes away one of our most potent defenses against fanaticism on all sides of the spectrum: Humor and Satire. 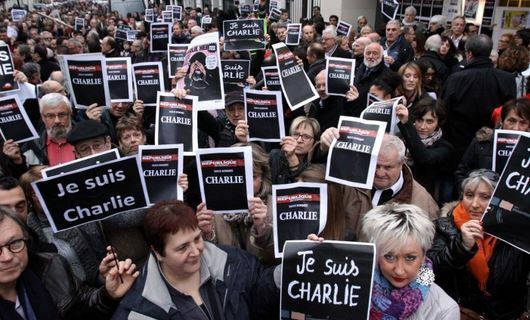 What do I think about the Charlie Hebdo terror attacks and the aftermath? I’ve been trying to stay out of it until the noise dies down. I hear a lot of voices saying what’s obvious and true: this was a sad, terrible act done by some extremists; this is a predictable outcome of blind, extreme faith; the few extreme members don’t represent the whole of any group. One thing I believe: it is the groups who feel their beliefs are above criticism who are in need of being deflated a bit with humorous satire. This idea that some beliefs can’t be questioned is a cancer. But let’s please try to confront it in a positive way. There was a great interview on NPR this week with a man who has reversed his radical views and is now fighting against the underlying causes of extremism. He makes the point that in Islam there is a core belief, even amongst many moderate members, that the prophet Muhhammad can not be criticized or joked about, and that this is at odds with modern democratic society where we demand the right to poke at our institutions/leaders/beliefs. Definitely worth listening to if you’ve got 30mins. Here’s the link: How Orwell’s Animal Farm Led A Radical Muslim to Moderation. 1. Side note — Early FSM people may remember J.T. Eberhard from the Missouri Pastafarians group. I was always a fan of his — one of my favorite things he did was building a box-fort in the middle of campus as a statement about religious discrimination. And another mass shooting in Vegas a few hours ago. I don’t know whether it was carried out by an insane nutcase with voices in his head, or an insane nutcase with voices in his head from his invisible sky-friend. I don’t like country music either, but I wouldn’t kill anybody over it. Americans seem to be armed to the teeth, but nobody’s able to pull out a weapon and shoot back when this kind of incident occurs. Rasputin, the shooter was 32 floors up; the audience didn’t stand a chance. Apparently, Americans can have machine-guns. Also, two more ISIS knife-murders in France. All of this could have been avoided. Should have eaten some pasta, drank a beer and got laid. Historically, the peace movements were reviled and persecuted by Federal Government, who wanted an aggressive intolerant population, who would support wars. Cap’n B., Rasputin – Hard to defend Merkin nutcases OR rightwing repression, but we do pray for the pendulum to swing toward sanity and less influence from the NRA and big bucks allies….lots of Americans are of that persuasion, believe it or not…. AF, we know that at least half of Americans are sane and decent people, but, a small percentage of the other half are dangerous nuts with multiple machine-guns. To me, a ‘professional gambler’ (except for games of skill), is a deluded, magically-thinking addict, who, will inevitably lose everything, and, it will always be someone else’s fault. Shows American nutcase psychopaths are superior to Muslim nutcase psychopaths. Yeah baby, USA! USA! Number One! Sad, sick and true. Las Vegas has a serious Ice problem. Interestingly, gambling stimulates exactly the same parts of the brain as Ice does, in what is called ‘cross sensitisation’. Thus, the big money made by Government from gambling, and the National promotion thereof, inadvertantly increases Ice use and the ensuing paranoia. Curiously, many/most ISIS fighters are permanently high on a related amphetamine, shipped in by the truck-load. Allah so hates people who jog or cycle in New York’s parks that he orders his followers to rent a truck and squash them. Makes perfect sense if you accept the beliefs of 7th century nomads. Allah is great! And another mass shooting, this time in a Baptist church in Texas. Shows people don’t need to be inspired by their bronze-age god to go on a rampage. One good piece of news: Whereas the Islamic sh*tbag killed eight people in New York, the Texan killed THREE TIMES AS MANY! Shows Texan Americans are much, much better than their Islamic counterparts. Everything is bigger in Texas, including psychotic murderers. USA is still Number One. What a ghastly, horrific situation. Our sympathy goes out to the bereaved. I hope the USA can alleviate the availability of weapons in the USA. The original idea behind the “right to bear arms” was to avoid creating a large standing army, which would be expensive and a potential tool for despots. A citizens’ militia was required to protect the new USA from King George’s redcoats, the native Americans and any slave uprising. Semi automatic handguns were never envisaged by the founding fathers. If I was an American, I would definitely arm my family with handguns. And that’s the trouble. Take away handguns from law-abiding people and the only people with handguns will be criminals. Rasputin, I believe that’s what many law-abiding USA citizens do. However, the biggest problem is the huge number of accidental shootings. I suspect that most gun killings are over drug deals. European countries provide maintainence treatment for addicts, whereas, that is illegal in USA. Against whom does the USA need a Bible-bashing, hick militia?